Tags: community, Inspiration, Moosilauke, Motivation, Outreach, Randy, Support. Veterans Day isn’t so special! My vision of Veterans Day is from my youth with fog encroaching on a chill morning over a memorial in my hometown of Colebrook, NH. The haunting echo of the bugle is barely finished when the 21-gun salute rips through the echo and startles my somber reflection. My parents and community had instilled in me a sacred duty to honor the service gifted by all our veterans to our country. Veterans Day was one of the special holidays. Is it still special? Certainly some make efforts to appreciate the choices and all too often sacrifices of our veterans. It does seem less emphasized to me today though, and I wonder if it’s the advent of so many “special” days, from “Unwrapped Twizzler Day” (yes, I hope I only made that up) to a culture that seemingly has lost some intensity of focus on any particular holiday or other day of note. Perhaps the ugliness of war and the reality of instant news coverage of any and every atrocity or failing has desensitized us and increased apathy? For me, all of this is entirely my subjective observation. I sadly believe it as firmly as I believe there are many very worthy causes deserving of our limited attention and it is our personal responsibility to cut through the dilution of emotion and give focus to as many as we can reasonably manage. Blindness is a cause to which I dedicate much time and energy. Cancer has impacted my life in so many painful ways it must get my full focus and all too often fury. These are reasonable and worthy points and I’m proud of the means by which I support them both. For all the people who do and have served our country, from my father to the many friends and family across all branches of service, I am humbled and appreciative. For some it may have been just a job or means to an education, and for some a career, but for all an agreement to serve. The reality of such service in hostile and abhorrent circumstances I likely may never fully fathom. I’ll be grateful all year for the very significant freedom their choices provide. On Veterans Day this year and every year, I hope I will join many in recalling the people who are the veterans so worthy of our dedication on their day. Thank you veterans and to all those who join in honoring them with me. 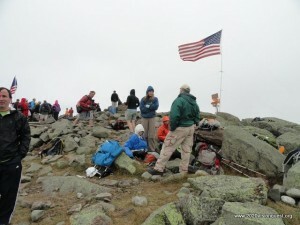 Tags: blind hiker, Flags on the 48, Hiking, Moosilauke, Randy. We founded 2020 Vision Quest on Independence day in the year 2010, the same year the “Flags on the 48” graciously allowed us to be part of the team on Mt. Liberty. There was some powerful anticipation in celebrating Liberty, Independence and Community even as we were slowly learning just how poignant the community experience was for this program. I remain convinced that in all challenges, the most impactful point for any of us is the moment we choose to begin taking positive steps forward. I hope that wherever you are as 9/11 arrives this year–or even Saturday, 9/8, when the Flags on the 48 will celebrate the event–you find the time to reflect upon all things dear to you and the many sacrifices involved in preserving them. I hope you will think of all the opportunities you have to take steps forward in a positive response to any circumstance. I’ll cherish the service of many who help support this outlook and I will recommit myself to giving the best service I can in the ways which I am afforded opportunity. Should you want just a hint of the flavor of how worthy and moving this experience may be, I encourage you to watch the video montage crafted by Tracy last year or read the words of my friends Jenifer and Rob as they wrote about their views on the experience. I took the time for all three of these things and feel better prepared to appreciate the moment and my life as a result. Thank you Tracy, Rob, and Jenifer! 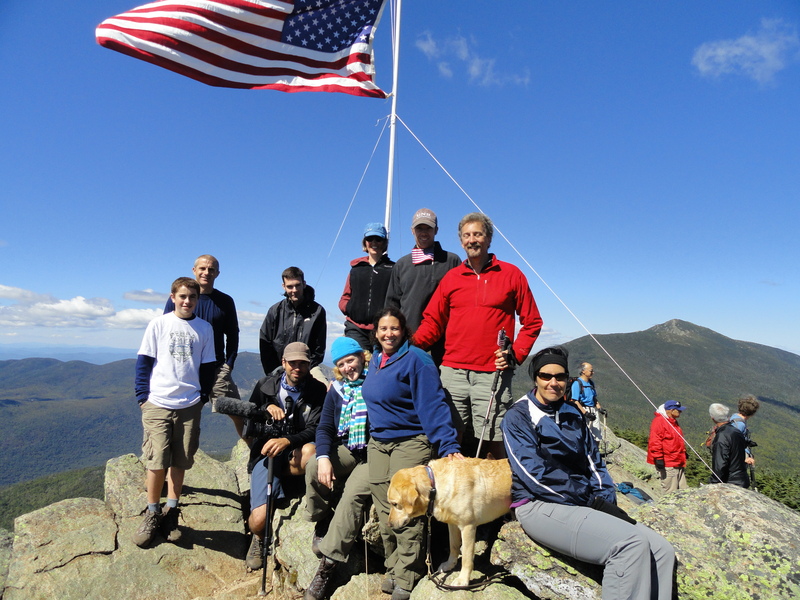 Tags: community, guest blogger, Hiking, Inspiration, Moosilauke, September 11, Support. The roar of applause upon raising the American flag gave me goose bumps up my entire back, finishing at the base of my neck. Hiking Mt. Moosilauke to raise the American flag on 9/11 as part of the Flags on the 48 program, I wasn’t sure what emotions I would feel. I anticipated feeling patriotism, some sadness, and being filled with very reflective thoughts. However I did not anticipate the tremendous pride I would feel being part of a team that displayed a tribute to our fallen heroes of September 11. The jubilation of the – I’m guessing – one hundred other hikers as we raised Old Glory on the summit was a tremendous feeling I’ll never forget. 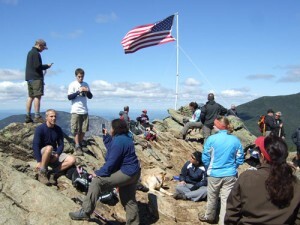 The group assembles the flag on the summit. We had a terrific team of hikers on September 11, 2011, with each member carrying part of the flagpole, flag or rigging to the summit. Once there, we each took a job we thought we could execute well – assembling the pole, deploying anchors in the rock or preparing the lines. 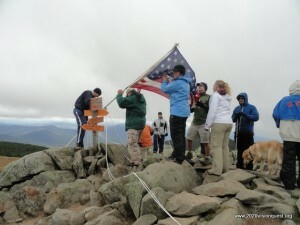 Given the size of our flag (6’ x 10’) and typical White Mountain winds, we secured our monument with no less than seven lines. I think it could have withstood 50 mph winds(! ), but fortunately we only experienced a fraction of that. 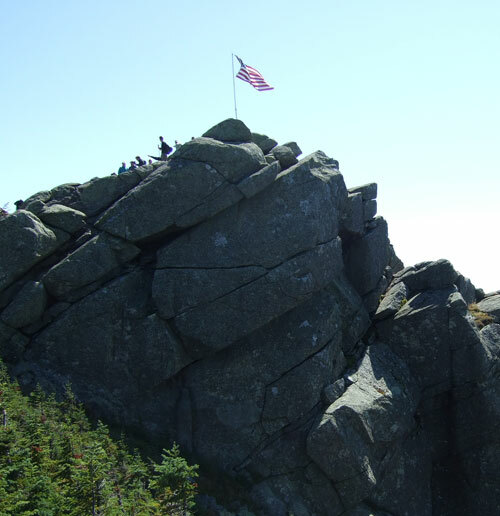 In fact, while the winds at noon were fairly strong (enough to make our flag fly very majestically), by the end of our stay the winds were not even strong enough to make the Stars and Stripes fly at full attention. There certainly was some sadness during our tribute. Thinking of the reason we were there is enough to make the toughest drill sergeant misty. We had some wonderful remarks by people who had special connections to 9/11. Those were excellent speeches, but I couldn’t help but wiping away the start of a tear thinking of all the people we lost ten years ago, and how some of their close relatives were with us today. 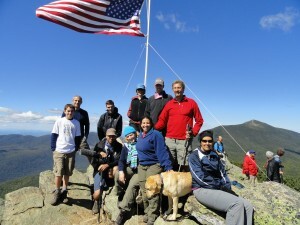 The hikers make new friends at the summit. One feeling I did not anticipate (but probably should have) was the warm camaraderie we shared with so many hikers we met for the first time while on Moosilauke. Hiking is an activity which lends itself so well to meeting new friends and sharing experiences, and this setting only enhanced that feeling. Our commitment flying the flag on the summit from noon until 2:00 pm made conversing with people easier. I can’t imagine we would have spent close to three hours on the summit had it not been for the Flags on the 48 program, but in doing so it forced us to relax, meet so many new people, share special experiences, and have long conversations about a myriad of topics – not just the two or three minute typical chat you might have with someone in that case. My day on Moosilauke was one filled with emotions I expected and didn’t expect, and gave me memories I will have forever. The group flies the flag on the tenth anniversary of 9/11/01. 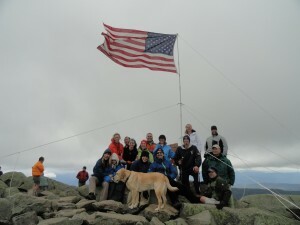 Filed under: Flags on the 48,Hiking,Moosilauke,Randy,Rob W.